The U.S. Congresswoman, elected in 2018 to New York’s 14th Congressional district, has been asked to speak at the festival two years after hard-left Labour leader Jeremy Corbyn took to the same stage. Corbyn and Ocasio-Cortez spoke on the telephone for 45 minutes in February, with Corbyn congratulating Ocasio-Cortez, often known by her initials AOC, on her election victory. Mr Corbyn said she was “challenging the status quo”, while Ms Ocasio-Cortez said of her conversation with Mr Corbyn that they shared a “great hope in the peace, prosperity, + justice that everyday people can create when we uplift one another across class, race, + identity at home & abroad”. It is not yet known if Ocasio-Cortez will accept the invitation to speak at Glastonbury, but it is reported that Jeremy Corbyn is waiting in the wings to speak in her place should she decline the offer. Ocasio-Cortez immediately made herself known on the political scene following her election victory when she proposed her so-called Green New Deal, a socialist programme which among other things proposed to retrofit all buildings in the U.S. to be environmentally friendly, curtail air travel, and end fossil fuel use. The proposal was heavily criticised by U.S. Republicans but supported by many Democrats, as well as Mr Corbyn in the United Kingdom. Ocasio-Cortez’s Green plans were so well received by some in Britain, they proposed to launch their own, with hard-left Green Party member of Parliament Caroline Lucas cooperating with members of the left-wing Labour opposition party to launch a “purposefully radical” new deal of their own. In her short time in politics, Ocasio-Cortez has caused a number of controversies. 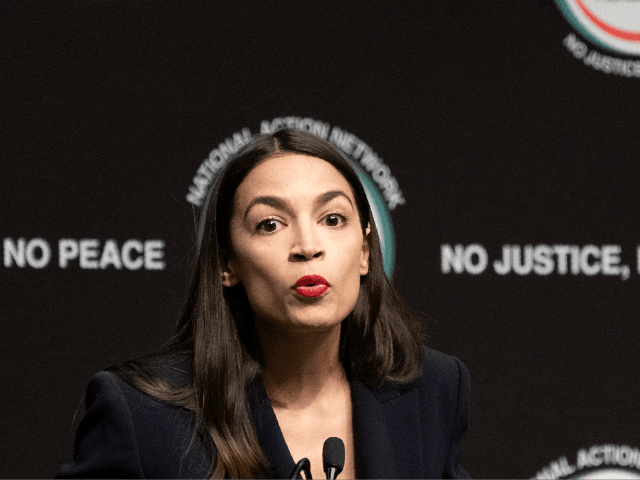 Most recently she publicly defended her Democratic colleague Ilhan Omar over comments Omar made about the September 11th radical Islamic terrorist attacks, which she downplayed as “some people did something”. Another controversy came as she told Dan Crenshaw, a Republican Congressman, to “go do something” about terrorism after he spoke out about Ilhan Omar and her September 11th comments. Crenshaw, a military veteran, lost an eye fighting in Afghanistan.